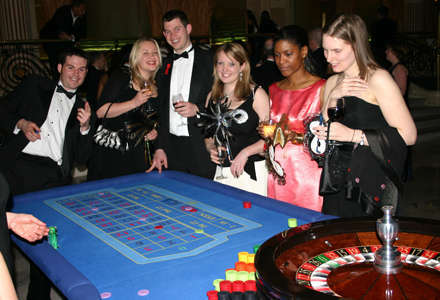 American Roulette Hire is one of our most popular fun casino hire games. Each american roulette player receives different colour chips to make it easy to identify which chips belong to each player. The player places his bets and the fun casino dealer spins the ball around the wheel. Once the dealer has announced ‘No More Bets’ no more chips may be placed or moved. When the ball drops into the winning number the dealer removes all losing chips and proceeds to pay the winners. There are a variety of bets to play on roulette and the player may play as many or as few as they wish. If any Fun Casino players are unsure of the rules, our professional croupiers are always willing to explain. American roulette is the most popular game to hire, both with our fun casino hire and also in real casinos across the globe. 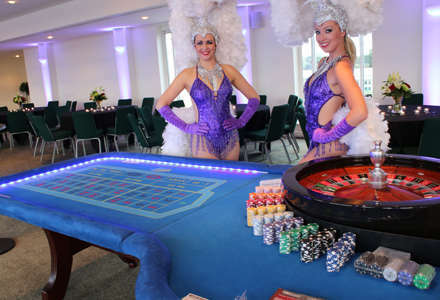 Not only is this game great fun to play and engaging, it is also the most visually stunning table with our full sized classic mahogany Cammegh roulette wheels, the finest in the world & much renowned within the casino industry. The game commences by each player receiving different colour chips, this makes it easy to identify which chips belong to which player. The player then places his bets and the croupier spins the ball around the wheel. Once the croupier has announced ‘No More Bets’ no further chips can be placed or moved. When the ball drops into the winning number the croupier removes all losing chips and proceeds to pay the winners. There are a variety of bets to play on roulette and the player may place as many or as few as they wish. Roulette can appear complicated but with the help of our professional & experienced croupiers new players will be able to learn the game very quickly, literally within a few spins of the roulette wheel. The roulette balls were initially made from ivory or wood. The roulette wheel was invented in the 17th century by a French physicist and mathematician Blaise Pascal. The game of roulette, or versions similar in design was played over various times and cultures including the ancient Romans, Greeks & Chinese. There is also the most widely held belief that the game was invented by monks in a French monastery.